If your knee is constantly sore and creaky, the idea of replacing it with a new "strong", metal-and-plastic version of the joint can be seductive. The surgery seems so easy and promises so much: better mobility, less pain, a resemblance, almost, of youth. But there is growing evidence that knee-replacement surgery results may not match the hype — and that many people considering the procedure would be better off saving the money, recovery time and disappointment. "...13 studies involving nearly 1,700 patients found the surgery did not provide lasting pain relief or improve function for most of them. Those studies compared the surgery with a variety of options, including physical therapy, exercise and even placebo surgery. Fewer than 15 percent of patients felt an improvement in pain and function three months after the procedure, and that those effects disappeared after one year, the review found. In addition, the surgery exposed patients to 'rare but important harms', such as infection." Casey Quinlan, 64, of Richmond, VA., said the procedure did not deliver. "It was not what I was told to expect," she said. Look, joint pain stinks. It robs you of mobility and can make even the simplest tasks seem like a struggle. And if you've tried every solution your doctor has prescribed (along with searching every corner of the web) you may be thinking it's the only option you have left. Are You Making This One Mistake (That Makes Matters Worse)? When your hip hurts, or your knee is stiff, or your back is throbbing... what's the first thing you want to do? Pop some Ibuprofen and REST. You want to stop moving so the pain can go away. 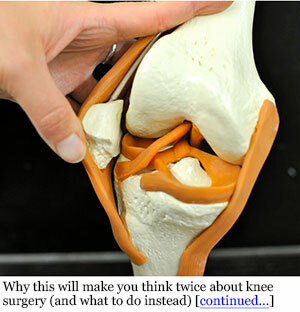 Plus, you don't want to cause even more damage to the joint, right? Of course not. But what you don't realize is that this the #1 mistake when it comes to their joint pain. "One of the biggest mistakes people make with [joint pain] is to limit movement of the affected joint, which leads to stiffness and weakness that only makes matters worse2." If you want to beat joint pain, you MUST keep moving. But when you're suffering from aches, pains, and stiffness - movement is the last thing on your mind. What you need is a safe way to soothe pain - without drugs (or even OTC meds) that are hard on your stomach, kidneys, and liver. And while easier said than done, a new twist on an old discovery is making that possible (and without the dangers and side effects of commonly prescribed treatments). In fact, it's been shown in more than a DOZEN research studies3,4,5 to help stop stiffness and improve mobility. 2 Jane E. Brody (Sep. 19, 2016). Don't Take OA Lying Down. The New York Times. 3 Bakilan, F., Armagan, O., Ozgen, M., Tascioglu, F., Bolluk, O., & Alatas, O. (2016). Effects of Native Type II Collagen Treatment on Knee OA: A Randomized Controlled Trial. The Eurasian Journal of Medicine, 48(2), 95–101. 4 Di, L., Mannelli, C., Maresca, M., Micheli, L., Martinez-puig, D., & Ghelardini, C. (n.d.). 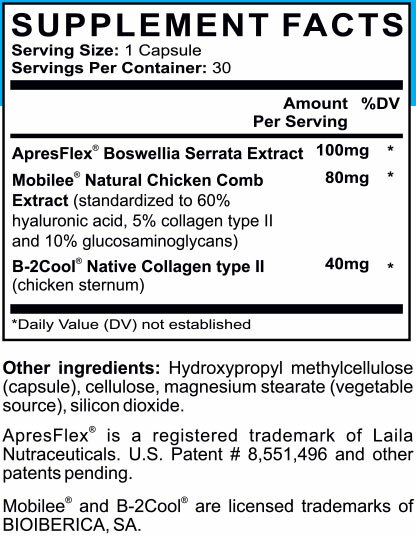 LOW DOSE CHICKEN NATIVE TYPE II COLLAGEN Inflammatory infiltrate. Florence, Italy. 5 Scarpellini, M., Lurati, A., Vignati, G., Marrazza, M. G., Telese, F., Re, K., & Bellistri, A. (2008). Biomarkers, type II collagen, glucosamine and chondroitin sulfate in OA follow-up: The "Magenta OA study." Journal of Orthopaedics and Traumatology, 9(2), 81–87. 6 Sengupta K1, Krishnaraju AV, Vishal AA, Mishra A, Trimurtulu G, Sarma KV, Raychaudhuri SK, Raychaudhuri SP (2010). Comparative efficacy and tolerability of 5-Loxin and Aflapin Against osteoarthritis of the knee: a double blind, randomized, placebo controlled clinical study. International Journal of Medical Sciences, 7(6), 366-77.